Wow, where has the time gone? I first started this post months ago, seems I have gotten a bit behind… Over the 4 day long Easter weekend the Frenchie and I headed to the coast for a quick, but much needed beach break. Hopefully I will get some time soon to post about the rest of the trip, but first I wanted to tell you about where we stopped on the way down and back. 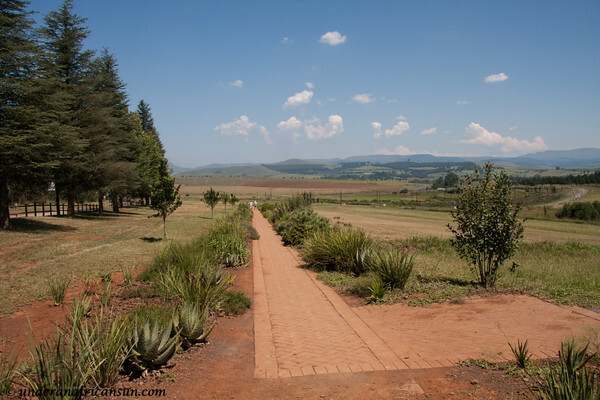 The Midlands Meander is a popular route in the KwaZulu-Natal region of South Africa. 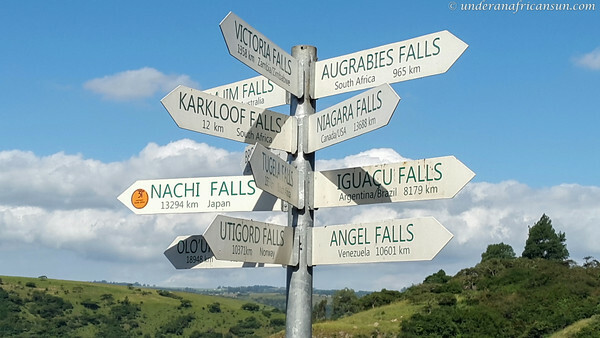 There are quite a few attractions to be seen in this area and while this would certainly be an excellent destination on its own, we were only passing through but still wanted to check out a few of the sites. 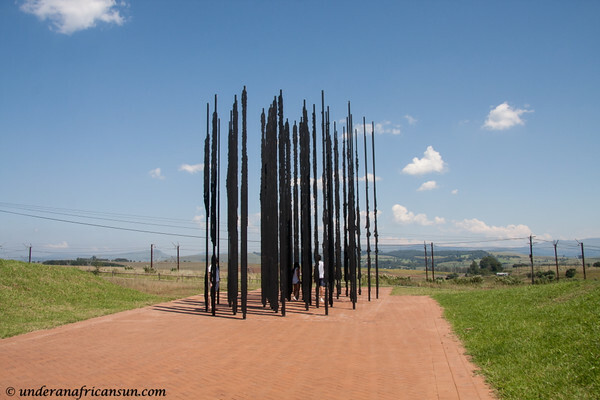 Our first stop on the way down was a place I had been wanting to visit for some time, the Nelson Mandela Capture Site. 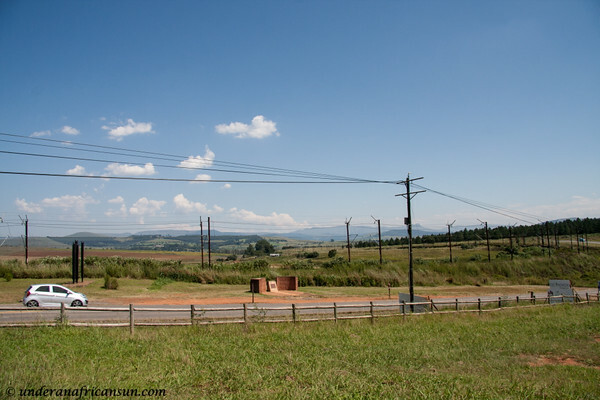 On August 5 1962, Mandela was driving the R103 just outside of Howick. He was posing as a chauffeur when he got pulled over and arrested. He was jailed and later tried in the Rivonia Trials in which he was sentenced to life in prison. 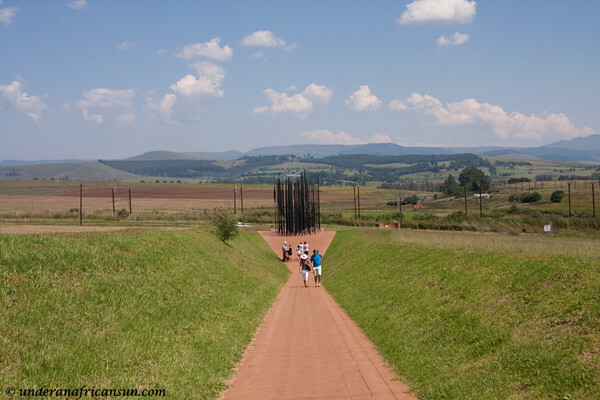 You can also read more about this in my post about my visit to Liliesleaf Farm (where Mandela was previously hiding out). 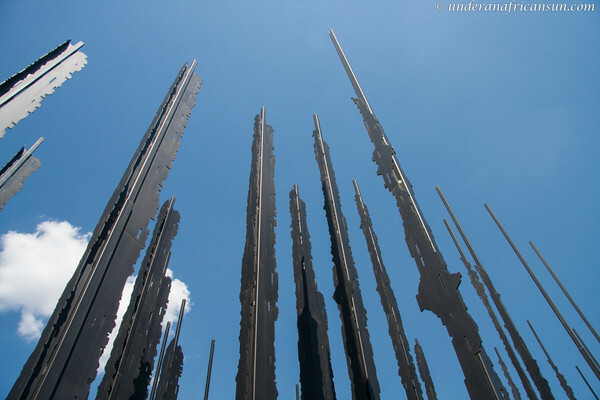 The monument is a sculpture designed from 50 steel columns between 6.5 and 9.5 meters tall. 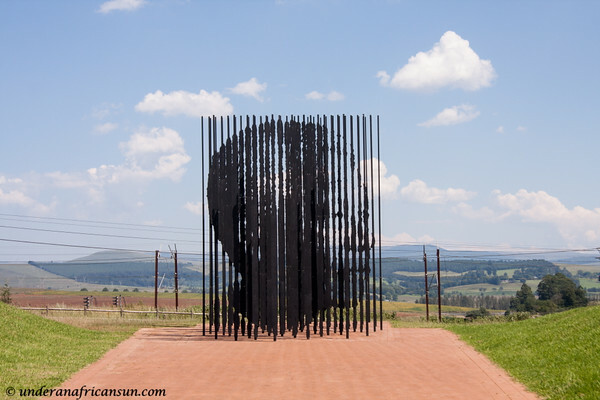 A collaboration between Marco Cianfanelli and Jeremy Rose, the sculpture’s 50 columns represent the 50 years since Mandela’s capture. I found the capture site deeply moving and the sculpture is such a unique tribute to such a special man. 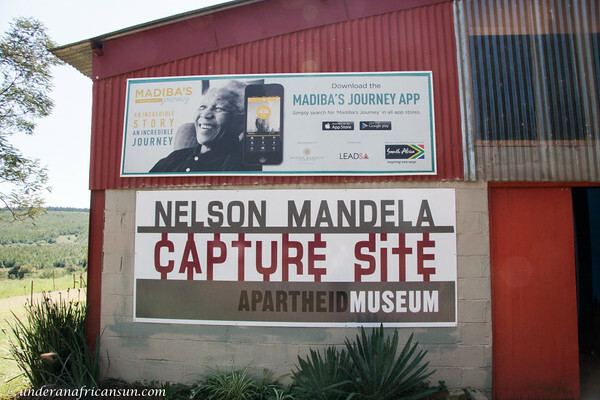 There is also a really interesting exhibition of Mandela’s life and the apartheid struggle (free entrance but donations accepted at the time of our visit) so be sure not to miss that. 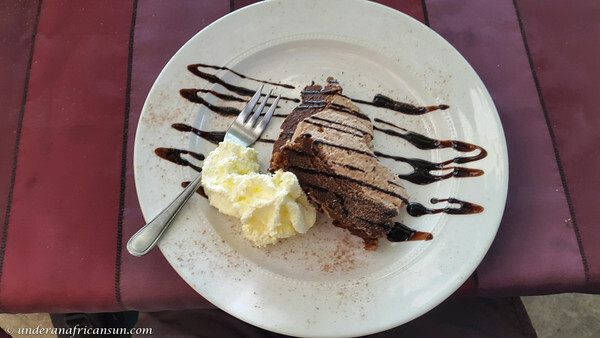 You can however, give the cafe a miss (friendly service but the rest could use some improvement) unless you are really pressed for time and need to get back on the road. A few days later we once again passed through the Midlands on our way back to Joburg. Due to our lunch experience on the way down, I was under a lot of pressure to find us a nice spot on the way back. 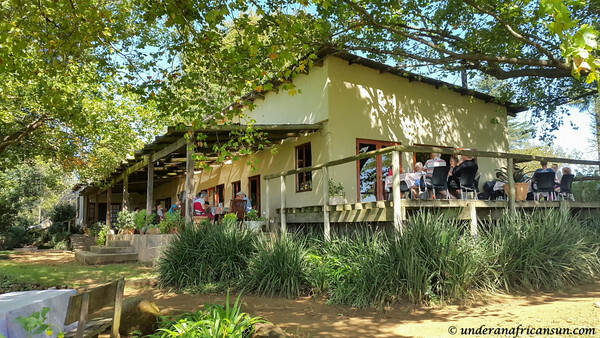 I got on tripadvisor and luckily found the restaurant Tumble Downs, just outside of Howick. I rang the restaurant and was relieved to hear they could get us a table. This restaurant was a terrific find. 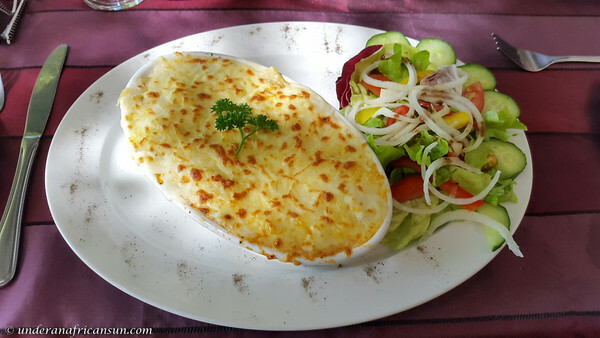 We were seated at a table on the terrace with a lovely view overlooking the countryside. Our lunch was really tasty and I was quickly redeemed for the lunch a few days prior. There were several veg options which is always nice to see. If you are in the neighborhood, I can highly recommend Tumble Downs, we will certainly be back. 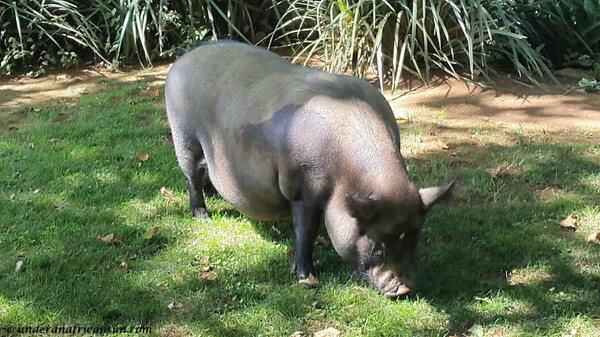 We had time for one more quick stop before hitting the road back to Jozi. 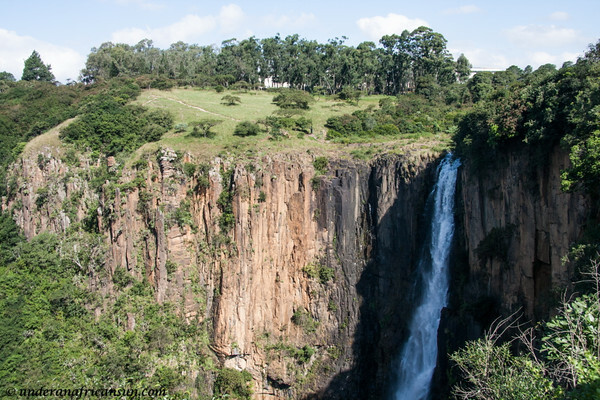 The Howick Falls are approxmately 95 meters tall and local legend says that a giant, serpent-like creature lived in the pool at the bottom of the falls. There are also some nice craft stands at the falls if you’d like to do a bit of shopping. 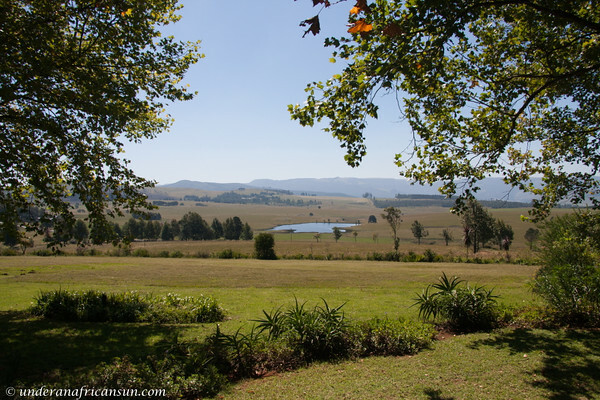 From the quick peek we had, the Midlands are a lovely place to visit and we will surely be back to Meander a bit more one day. 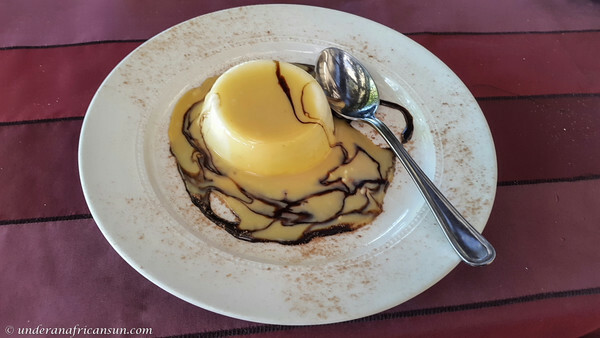 If you have any not to miss places I should visit next time, please let me know in the comments below! 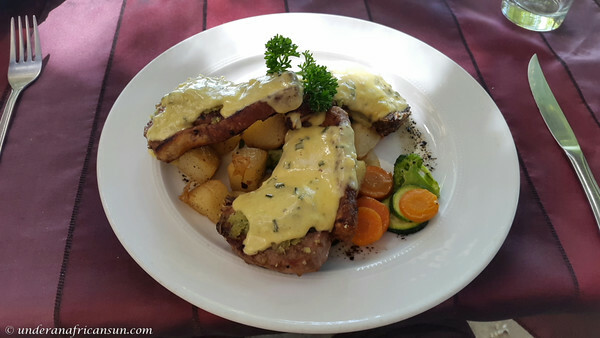 This entry was posted in Food and Wine, History & Culture, Restaurant Reviews, South Africa and tagged Food, History, Nature, Restaurant Review, South Africa by UnderAnAfricanSun. Bookmark the permalink. Thanks! Have a great trip, looking forward to reading all about it.